Exterior view for Mr. Biraj Minz Jashpur Chhattisgarh. We are extremely grateful for the satisfaction and comfort projected by you. This project is one of the certificate that Architect Shadil and Team is expanding not only in Raipur but to all parts of Chhattisgarh. WORKING ELEVATION makes easy for the contractor to work in a detailed manner. Without it, just viewing the exterior view photograph, it cant be understood about the dimension of the each element to be assigned in the same fashion as of view. Satisfaction of the client matters us a lot. Congratulations Raipur and Chhattisgarh, Architect Shadil and team is live now. Renovating a residence is a great adventure because of too much limitations. However, the aspirations of the client matters a lot. Billion thanks to Mr. Ganesh, Kota Raipur for the faith you showed towards Architect Shadil and team. We are moving ahead inch by inch each day towards perfection so that Chhattisgarh may feel blessed for our existence. Real estate attached professionals of RAIPUR city like PLUMBERS, ELECTRICIANS, PAINTERS, FALSE CEILING, FABRICATORS, CARPENTERS, CIVIL CONTRACTORS, and other similar professionals who are really good generally approach Engineers and Architects like us and others to recommend their name to the clients. Lets empower them. An initiative from our side is including their name in our directory www.TEAMSHADIL.in so as the client just gets directed towards them. Let them handle and negotiate with the clients separately. No interference from our side. Welcome on board Architect Yogendra Sahu and Interior Designer Dinesh. You are really one of the finest and best Architect/ Interior designers in Raipur Chhattisgarh. Many a times people, there are people who can't spend much in building consultancy services. Therefore, We are doing Consultancy-Lite for those people who can’t afford an Architect and Engineers.Let them also organize their space and live a healthy life. Our consultancy lite is the most economical service where we provide planning naksha only at 3 rupees per square feet. This is one of the minimum fees in Raipur Chhattisgarh and the quality we provide is up to the maximum possible level. And not to forget, the satisfaction of our clients is something we admire the most. EXPLODE VIEW In the era of computers and devices, why should not we imagine each and every corner of our future building. With the Exploded view, we can imagine our plan in 3 dimensional way. Pioneer and young team of architects and engineers work seamlessly to realize your dream. However, the head of the firm Architect Shadil always oversee the works without fail. 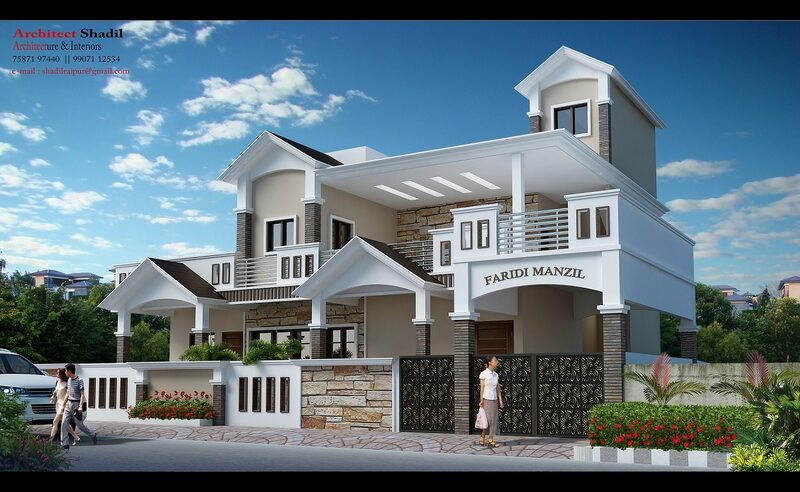 Making of residence for Mr. Faridi at Bhilai nagar, Chhattisgarh going to end soon. Painting and tiling work, Building elevation and finishing touches going on. However, Architect Shadil and our team which includes top architects, interior designers, supervisors visit the site at every development and take care of that.